When it comes to budgeting for your vacations, travel insurance is one of those things that’s often overlooked. It’s easy to understand why: we have publicly funded healthcare in Canada, so many people assume that benefit applies to wherever we travel in the world. Unfortunately, that’s not the case. The cost of seeking medical attention outside of Canada is expensive. Honestly, a quick trip to the doctor or emergency room in the U.S. could cost you hundreds of dollars. If you need serious treatment, you could be looking at a bill in the tens, if not hundreds, of thousands of dollars. The good news is that travel insurance will cover you and there’s a good chance you may already have it if you hold one of the best credit cards in Canada. But let’s look at the different types of travel insurance that you need to be aware of. Travel medical: This will cover any kind of emergency medical attention you may need including emergency evacuations. Make no mistake, having travel medical insurance is a must. Trip cancellation/interruption: Sometimes you need to cancel your travel plans, or things get delayed. Assuming there’s a qualifying reason, trip cancellation/interruption insurance will reimburse you for any travel costs up to a certain amount. Lost or delayed baggage: Every policy is different, but generally speaking if your luggage is lost or delayed for a pre-defined number of hours (e.g. four or six hours), you’ll be entitled to a fixed amount to make purchases. Accidental death and dismemberment: With A&D insurance, you (or your beneficiary) gets a fixed amount if you lose a limb or dies while travelling. Hopefully, you never have to make this kind of claim. Car rental collision/loss damage waiver: This one is a mouthful, but it’s basically a rental car insurance covering collision damages only. It does not cover 3rd party liability e.g. if you damage somebody’s property. Generally speaking, there are two ways you can qualify for “free” travel medical insurance. Every policy is different, so you’ll need to read the details. Employee benefits: Many employers include travel medical insurance as a benefit to their employees. They usually don’t include trip cancellation/interruption or baggage insurance, but at least you’ll be covered for medical which is often the most important thing. Travel credit cards: Many of the travel rewards credit cards in Canada offer good travel insurance, but keep in mind that there are different eligibility limits. This usually applies to people over the age of 65 where the limit to their insurance is reduced or, even, not available. The good thing is that you can usually purchase additional insurance at a reasonable rate. Again, every insurance policy is different. You should always read the details of the policy so you know exactly what you’re covered for. Let’s look at one of the more popular travel credit cards to see what travel insurance is offered. The BMO World Elite MasterCard has one of the best travel insurance policies out there because it covers just about everything that could go wrong on a trip. For example, if you slip on a pool deck in Florida and require stiches on your forehead, your emergency medical insurance covers you for up to $2 million. Note that to qualify for many of these benefits, being a cardholder is not enough. You usually need to charge the majority of your travel expenses (flights, hotels, and car rentals) to your card to get your coverage. It’s easy to see why having a credit card with travel insurance is appealing. 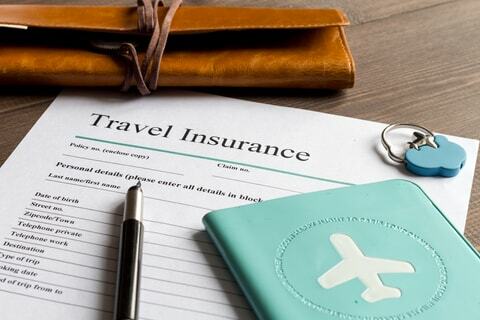 The insurance is usually more valuable than the annual fee that you may pay on your card; plus, you can earn points which can be used to claim travel rewards later.